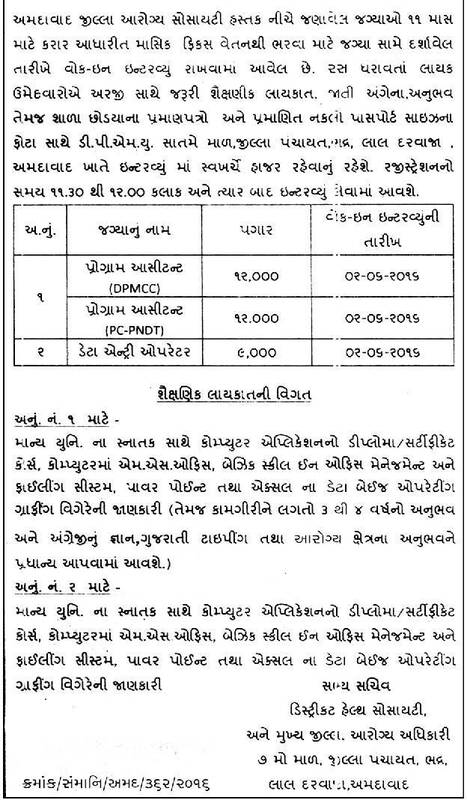 District Health Society Ahmedabad has published a Advertisement for below mentioned Posts 2016. Other details like age limit, educational qualification, selection process, application fee and how to apply are given below. Salary : Rs. 09,000/- per month. Educational Qualification : Any Graduate / Diploma/Certificate in Computer Application, Microsoft Office, Accounting Software & Computer Hardware knowledge , Having good skills in Office Management & Filling System. Registration Time : 11:30 a.m. to 12:00 p.m.